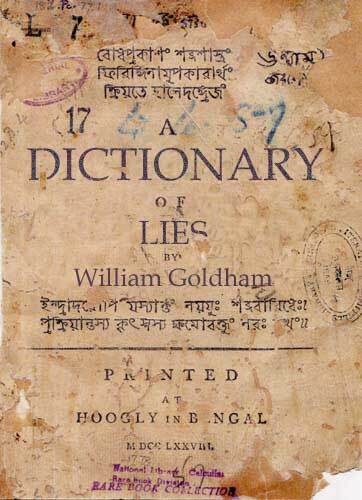 The DICTIONARY OF LIES was first published in 1765. It was written by William Goldham, a small, angry man. It contains totally incorrect definitions of all English words that were then in usage. Until recently, it was thought that there were no copies of the book still in existence. However, one copy surfaced in recent years and eventually found its way into the posession of a Chicago bookseller. Here, for the first time on the internet, is an exclusive extract of the DICTIONARY OF LIES, covering words beginning with the letter B. The exact purpose of the DICTIONARY OF LIES is still a mystery. Clerics and scholars have proposed various theories, but they are all wrong.